If I am a local company with one location that services people at their home, how do I rank for all the cities in my area? You don’t rank in the maps section. 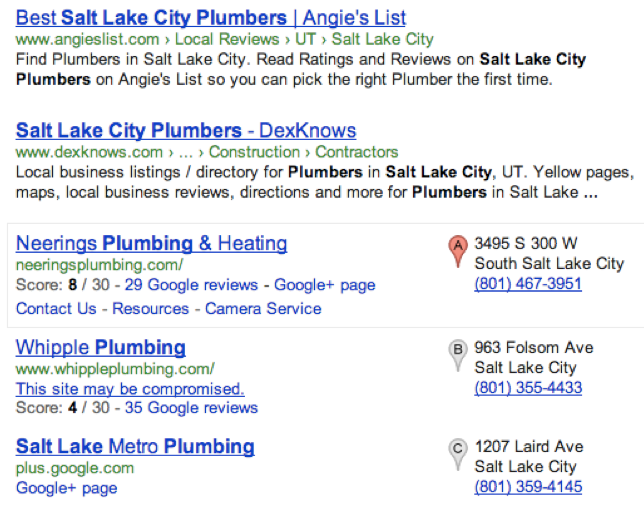 Google will generally only let you rank in the city your address is located. There are exceptions, so don’t plan on being one. You can build out content on your website to rank organically for the other cities (where you don’t have an address) and in a lot of cases today, if your organic page has stronger singles than the listings found in the map results you can actually rank above the maps like this. You can also get a real address in the cities that you want to rank in. Fake address and PO boxes have been popular for some businesses to use, but they carry a huge risk. My advice is to play it safe and go with real locations where you can conduct face-to-face business, or try to rank organically.